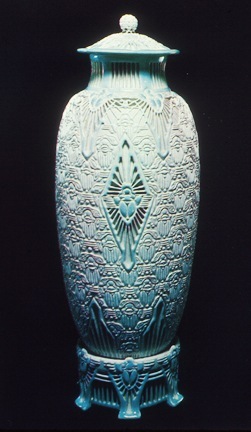 The Scarab Vase is why we have terms like “tour de force.” It is Adelaide Alsop Robineau’s undisputed American Arts and Crafts era masterpiece. They say “beauty is in the eye of the beholder.” As such, a list of items that are ‘beautiful to look at’ (ie: famous for being famous) would be never ending, and ever disputed. A truer (or at least fuller) appreciation of an item’s impact considers it’s context. This is where the Scarab Vase stands head and shoulders above the crowd. The 19th century American Industrial Revolution destroyed the livelihoods of thousands of small-time individual potters. Hand made pottery was moribund. Late-century China Painting barely kept alive the notion of individualized pottery. But something was missing. It’s interesting to witness how people throughout history react when they sense a fundamental loss due to mechanization. Like the Luddites, or the ‘back-to-the-lander’s.’ Looking back years from now, will some definitive, paradigm-shifting work stand out as a reaction to today’s wireless world? What would that look like? At the dawn of the 20th century, the reaction against industrialization looked like “The Arts and Crafts movement.” This movement, defined by works like the Scarab Vase, reignited interest in hand made pottery in this country. Today’s potters ply their trade because tenacious people like Adelaide Alsop Robineau prepared the way for us. The historical overview in Janson’s sweeping tome went like this: Chapter One: Magic and Ritual, the Art of Prehistoric Man, Chapter Two: The Art of Egypt, Three: the The Art of the Near East, then the Aegean, the Classical Greeks, the Romans, Mediaeval art, the Renaissance, the Mannerists, etc. on up to today. Here was humanity’s aesthetic progress rising from primordial beginning to sophisticated present. Janson’s opening “prehistoric” chapter included several images of African wood carved sculptures alongside images of Paleolithic cave paintings. Professor Roy pointed out that all the African sculptures had been made within 50 years of the book’s publication. Hmmm. Here was a bad attitude hiding in plain sight. Later, when studying redware, I found that old sources of information can offer more than stale, ossified opinions. 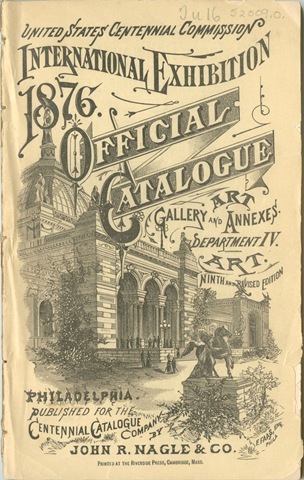 For example, there is something fresh in reading about “current trends in American pottery,” including an “up and coming” woman named Adelaide Alsop Robineau. Old knowledge is a valuable resource, not to be ignored lightly. Just never confuse old knowledge with bankrupt ideas. The Potter’s Craft. Charles F. Binns. Van Nostrand Co./NY. 1910. You are currently browsing the archives for the Adelaide Alsop Robineau category.